These are lab made laminates bonded to teeth to change the appearance, shape and colour of your teeth. Porcelain Veneers, also referred to as dental veneers or porcelain laminates, are wafer thin shells of porcelain that are bonded to the front of teeth to create a cosmetic improvement and sometimes a bite improvement. Porcelain veneers have successfully improved smiles by making dark teeth look lighter and healthier looking. They can make yellow teeth permanently whiter and gray tetracycline stained teeth look much more natural. Porcelain veneers can make crooked teeth look straight in just a few days. Patient’s can look and feel more confident, more professional and have a wonderfully natural looking smile. Porcelain veneers are highly resistant to staining from coffee, tea or even cigarette smoking. Veneers and laminates have a natural appeal to them and last anywhere between 10 to 50 years depending on the skills of the dentist. Porcelain veneers are brushed, flossed and treated just like natural teeth. You should not even know they are in you mouth as they become integrated into your natural tooth structure. The treatment is short as it could take from a couple of days to three weeks to make the veneers depending on the complexity. A mould of your tooth is taken for the fabrication of the porcelain veneers that are constructed for each individual tooth. The custom made veneers are then bound to your teeth with a very strong adhesive. There are a huge variety of adhesives and techniques to using these special dental bonding adhesives. The technique of the dentist is critical at this stage to avoid veneers that fall off (they should not). Dental Bonding is important but the patient should be able to see the veneers in their mouth before they are bonded. The patient may want a whiter color or not like the look of the porcelain. The patient needs to be involved in the quality of care. 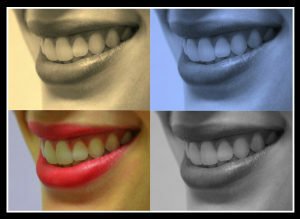 There are many advantages of getting porcelain veneers. First and foremost they will give your teeth a natural and healthy appearance. Porcelain veneers have an advantage over other cosmetic bonding techniques since they are translucent and have a glass like appearance that is undetectably natural looking. After the laminates are bonded to the surface of your tooth they duplicate the features of natural dental enamel. Aesthetic restorative procedures can be mastered consistently only if both the clinician and ceramist are intimately familiar with the basic principles of natural oral aesthetics. Understanding aesthetic principles is not limited to only tooth aesthetics but includes gingival [gum] aesthetics and the final aesthetic integration into the frame of the smile, face, and more generally, the individual. Emerging concepts in biomimetics provide the ability to restore the biomechanical, structural, and aesthetic integrity of teeth. More sound tooth tissue is preserved, tooth vitality is maintained and treatment is less expensive than traditional and more invasive prosthodontics.